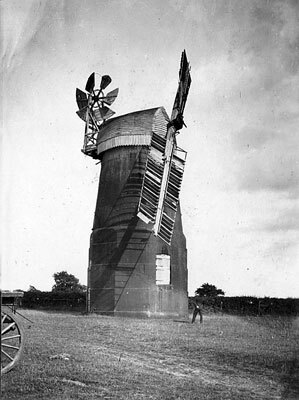 Kenninghall Banham Road tower windmill stood to the north of the village on the east side of Banham Road. The mill was built on the 10 sided, 2 storey brick base of a smockmill that had just been dismantled on behalf of the owner, Miss Sarah Ann Foyster. A tablet in the new brickwork was inscribed S. Foyster 1863. The round brick tower added an additional 3 storeys to the mill, making 5 in all; the ten sided base had stepped vertical walls becoming round and tapering half way up. 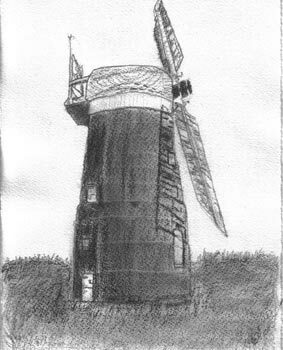 The mill had a Norfolk boat shaped cap with a petticoat and a 6 bladed fan. Four double shuttered sails, each with 9 bays of 3 canvas shutters drove 2 pairs of overdriven French burr stones, a flour machine and an oat crusher. The fan had a low gearing and it took 1,170 revolutions to turn the cap in a full circle, thus at 120 revolutions per minute it would take 5 minutes to turn the sails 180 degrees. The sack hoist was powered by a vertical chain drum with a counterweight to pull off the drive. A steam engine was also being used by 1883. Tower possibly a 10-sided smock originally with stepped brickwork. Fan drive: "Differential" drive with double bevel reduction gear driving a horizontal spindle which terminates in a cluster of three bevel gears near the centre line of the cap, the final drive being by twin spur pinions to a rack on top of the curb. Ratio of fan drive is 1,170 to 1. Bell alarm trailed on to the arms of the great spur wheel. Sack hoist:- A 3 ft. pulley on the upright shaft drove by slack belt to a vertical chain barrel. Spur wheel has wooden ring on top side with an iron cog row bolted on which is engaged by a 12 ins. wooden nut on a shaft with a 2 ft. 6 ins. wooden drum driving a flour machine and an oat crusher with both rollers geared, also a mechanical feed. The oat crusher has a countershaft which was pulled back to tighten the belt. The two sets of governors are in the floor below, belt driven off the stone spindle extensions, the latter resting on wooden bridges. A pillar in this floor gives support to the upright shaft above. Tower 10-sided on ground & first floors then round. One sail blown off in 1919, opposite one removed. In 1947 2 double-shuttered patent sails, canvas shutters. Cap not centred by usual wheels. Instead 2 large double-flanged rollers at the head, with a smaller one each side of them, one each side and 2 at the tail. Fan drive taken by cross-shafts in the centre of the cap to pinions operating on the curb, the rack being on top. Clasp-arm brake wheel 8 ft. diam. wood geared to 4 ft. 6 ins. all-iron wallower. Iron windshaft tapering from 10 ins. behind brakewheel to 7 ins. at tail. Upright shaft 1 ft. square for wallower mounting & round below. On corn floor bins reach ceiling. Upright sack hoist shaft belt driven from a pulley on the main shaft and pulled sideways to tighten the belt. Two pairs overdriven stones in octagonal vats. 5 ft. 10 ins. diam. all-iron great spur wheel. 13 in. wooden stone nuts. Flour machine and oat crusher. 2 sets governors on floor below belt driven off stone spindle extensions. Steam mill, later oil engine alongside. 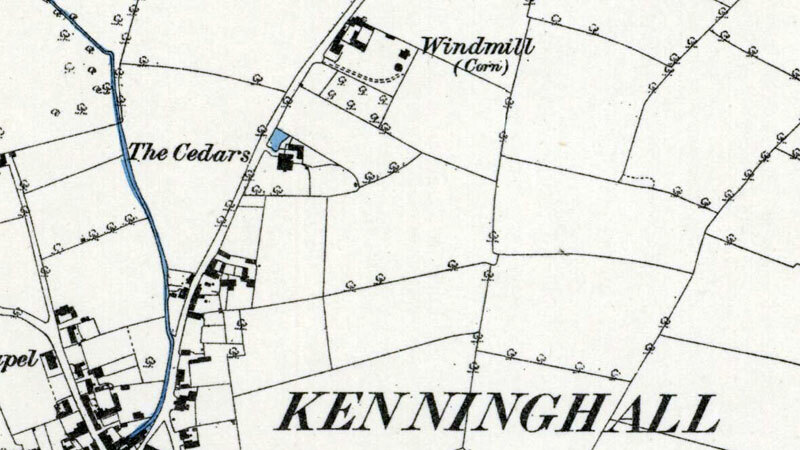 At Kenninghall cap lifted off Wells' mill and wrecked. KENNINGHALL, Norfolk Within Three Miles of Eccles Road Station Valuable PROPERTIES comprising a well built DWELLING HOUSE with capital Grocer's & Draper's SHOP, Outbuildings, Granary, Garden, Orchard & Pasture LAND in the occupation of Mr. H. C. Snelling. The Compact Small FARM with good House, Premises & 5 Enclosures of excellent Arable & Pasture LAND in the occupation of Mr. Charles Burrows. 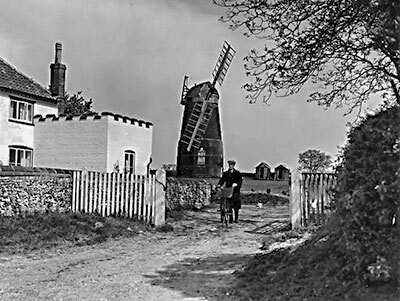 The substantial Brick built Tower WINDMILL with convenient DWELLING HOUSE, Offices, Granaries, Engine House, Farm Premises & several Enclosures of good Arable & Pasture LAND as occupied by Mr. Alexander Wells, the whole containing 51a. 0r. 37p. which Salter & Simpson are favoured with instructions from the Executors of the late Miss Foyster to Sell by Auction at the Crown Hotel, Kenninghall, on Tuesday June 22, 1886 at 5 for 6 in the Evening, in 4 Lots. KENNINGHALL, Norfolk Within Three Miles of Eccles Road Station Valuable PROPERTIES comprising a well built DWELLING HOUSE Grocer's & Draper's SHOP with Outbuildings, Orchard etc., a Compact Small FARM with House & Premises, a substantially built Brick Tower WINDMILL with capital House & Offices & several Enclosures of good Arable & Pasture LAND containing in all 51a. 0r. 37p. which Salter & Simpson are favoured with instructions from the Executors of the late Miss Foyster to Sell by Auction at the Crown Hotel, Kenninghall, on Tuesday June 22, 1886 at 5 for 6, in the following Lots. Lot 4. A substantially built Brick Tower WINDMILL with four floors, driving two pairs of French burr stones, with engine house; also a comfortable DWELLING HOUSE, newly erected Office, Farm Premises & several Enclosures of good Arable & pasture LAND containing 37a. 2r. 10p. in the occupation of Mr. Alexander Well at the annual rent of £90 & abutting upon the property of Lord Albermarle, Mrs. Sayer & Mr. Hotson. Particulars of Mr. L. Lane, Solr. Kenninghall or of the Auctioneers, Attleborough. Mrs. H. A. Bailey wrote to Philip Unwin on 28th July 1973 to say that Alexander Wells was the cousin of Thomas Wells of Winfarthing Road, Banham. The first meeting of the creditors of Frederick William Cross of Kenninghall, miller, farmer & corn dealer, was held at the offices of the Official Receiver, King St., Norwich on Saturday. Debtor's statement of affairs showed an indebtedness of £476. 18. 11 to twenty three secured creditors & a further liability of £364. 15. 5 to one creditor partly secured. The assets, as stated & estimated by the debtor amount to £455. 2. 4 leaving a deficiency of £464. 1s. The causes of failure, as alleged by debtor are, "Bad trade & competition & expenses of carting." The Official Receiver will wind up the estate. Re Frederick William Cross, farmer & miller, Kenninghall, Norfolk. Gross Liabilities £942. 3. 4, expected to rank £841. 14. 4. deficiency £464.1s. Debtor started business as a farmer at Worstead, taking a farm of 70 acres in 1896. He had no capital & borrowed £500 of his wife, who got it from her father. It was gift not a loan. The farm was not a success & at the end of eight years he gave it up. When he started at Kenninghall, he thought he was worth about £200; he didn't now think it could have been so much as he was owing the bank £68. He took the mill & 30 acres of land at Kenninghall at a rent of £70 a year. The trade was worth £30 to $40 a week, but it was not sufficient to meet the expenses & though he did not know it, he was slipping back. The Official Receiver said the debtor's assets would realise £125 more than he estimated so that his deficiency would be reduced to £340. The examination was closed. Frederick William Cross later emigrated to Canada. Imagine my excitement when I found your article on the return to Windmills. There was my family listed. My father was Robert Wells son of Alexander Wells. He was born in Kenninghall after Arthur Wells listed in your article. My family tree goes back to Henry Wells who died at Grove Farm in Banham around 1800. My son, his family and I come every couple of years to Norfolk and I always find something new and wonderful for my geneology. Norfolk has become a part of our soul, My son walks the land where they lived. For many years I paid dues to the friends of the windmills organization. 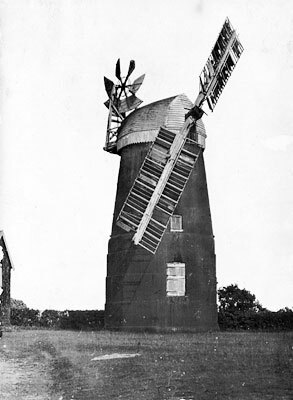 I do have an old picture of the mill in Kenninghall_on_Banham_road. Henry Wells Sr. was the man who did the wonderful steeple on the St. Mary's church in Banham. Two Wells sisters started the first school for teen age girls in Banham. My father came to America as a stow-away into San Francisco in 1910. Then went back to England and fought in WW1. I will be coming once more to Norfolk hopefully next year bringing my grandchildren to experience this wonderful place that has so much history. I would be happy to have contact with someone in the area who might have some history to share. I am a real estate broker in North San Diego County. Still working at 80+. Wells was my maiden name.